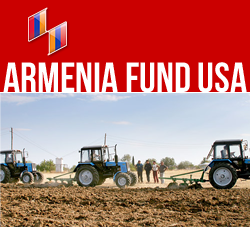 Yerevan, May 22, 2015 — The Hayastan All-Armenian Fund delegation, led by Executive Director Ara Vardanyan and comprising trustees, representatives of affiliates worldwide, benefactors, and associates, visited Artsakh’s Askeran Region on May 22 to unveil two newly built community centers, in the villages of Khachmach and Shosh. The construction of the Khachmach community center has been made possible by the financial support of the fund’s Lebanese, Brazilian, Dutch, Greek, and Cypriot affiliates as well as the government of Artsakh. The two-story facility, which houses the mayor’s office, a health clinic, a 150-seat events hall, and a computer room, will serve the 233 residents of the village. The Shosh community center was built through the co-sponsorship of the fund’s French affiliate and the government of Artsakh. Encompassing the mayor’s office, a health clinic, a library, a computer room, and an events hall, the structure is poised to help improve life in the community, which has a population of 610. The festive opening ceremonies were headed by the Artsakh Prime Minister Ara Harutyunyan. Another project in Shosh, the community school, which was built with the sponsorship of the fund’s Toronto affiliate, enjoys the continued support of Toronto Armenians. A few months ago, the campus underwent extensive renovations and has a brand new look a decade after its construction.